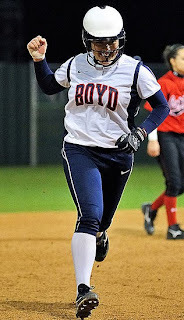 A child’s motivation to play sports arises from both internal and external rewards. 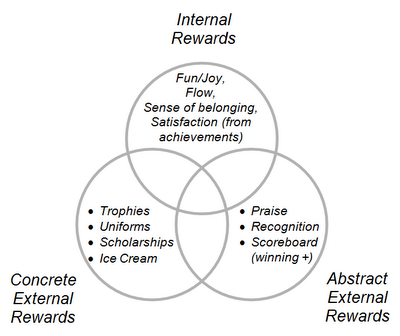 Internal rewards are ones that are intrinsic to the activity itself—the feelings within us that are evoked when we engage in a certain behavior. Examples include the satisfaction a child gains from mastering a new skill or performing to personal expectations, the thrill of participating in a close contest, the joy from running around and expending physical energy, the warm sense of belonging (to a larger group who share similar values), and while playing, experiencing the “flow” that comes from an expanded awareness and living in the moment. External rewards, on the other hand, are ones that come from outside the activity—usually from another person. These external rewards can be either abstract or concrete. For example, praise received from a parent or coach for performing a certain behavior well is an abstract external reward, as is an excessive focus on the scoreboard and winning. Treating a child to an ice cream cone after a good game is an example of a concrete external reward. Both internal and external rewards play a role in motivating an athlete. At more competitive levels of play, external rewards such as playing time, public and peer recognition, scholarship offers, and money can all drive training and performance to higher levels. In youth sports, and especially with beginners, parental praise often plays an important role. It helps motivate a child to play sports at a time when his or her skill level doesn’t generate the necessary internal rewards. Similarly, trophies and wearing “cool” uniforms are external rewards that can motivate a young athlete’s interest in sports. But external rewards also have a downside. 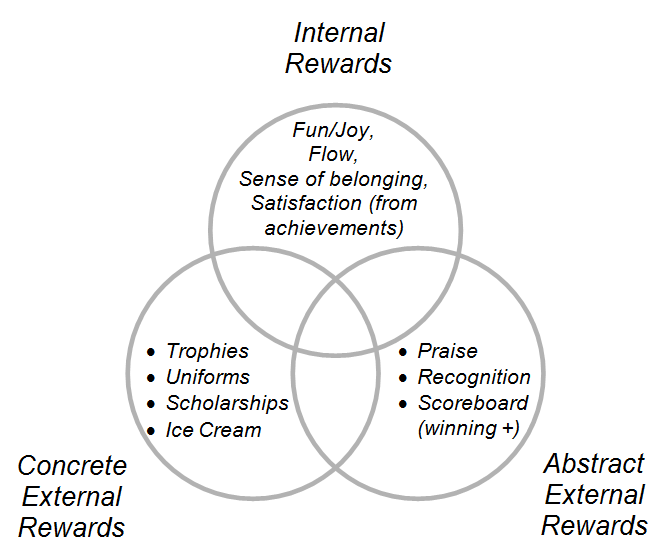 Too much emphasis on these types of rewards may cause a young athlete to lose sight of the intrinsic motivators associated with playing the sport. And when the external rewards disappear, so does the child’s desire to participate. Seek out coaches who not only teach technique, but also help elicit an understanding in your child of the internal rewards and benefits of participating in the sport. Lessen excessive parental praise, criticism, or other external parental influences that can dull your child’s joy of participation and sense of self-reliance. Promote opportunities for your child to enjoy unstructured and self-organized play (neighborhood pickup games). Play catch with your child or engage in some other family sports activity (one with fun, friendly competition). Consider extending the family dinner time to include these activities. Emphasize the internal rewards and use external ones only when required. Nice post, Jeff. I am not a big proponent of the trophies for everyone phenomenon ever since I had a kid (my assistant coach's daughter ask at the second practice of the season, "when do we get our trophies?") They were 5 year olds I think. But I do appreciate the place they play, when done purposefully and well, with the younger age group. I do wonder, though, if we shift or alter their sensitivity to internal rewards when we offer bigger and bigger external ones. (or raise the ante so to speak) I mean, what does fun and playing with friends feel like compared to the state championship on the line? Thanks Wendy. The participation trophies do get a little ridiculous at times, don't they? But I agree that they serve a positive purpose in the right setting. I would like to believe that the fun and hard work models can coexist with most children. Even where a talented young athlete is dedicated to achieving a challenging goal, injecting some fun athletic activities to balance the total experience seems reasonable. Ideally, shouldn't a child learn to appreciate both aspects of participating in sports? I enjoyed the thrill of participating in an intense, varsity basketball game in high school. But I also enjoyed the relaxed fun of neighborhood pickup games with friends and the almost meditational qualities of solitary practice. The problem to my mind is when parents or coaches lose sight of providing a balanced approach—especially for the average kid participating in organized sports. This is when the intrinsic joy of playing sports is overwhelmed by the external motivators (pleasing the parent or coach, assuming goals that aren't generated internally, winning above all else, etc.). Parent with a big heart...trying to keep it fun. I don't work with kids as young as yours. But at that age, it certainly seems too young to be rewarding certain kids based on outcomes (goals, etc). I would think that any unique individual rewards could be handled via verbal praise. Any external, tangible rewards at this age should probably be given to every child on the team. I took a quick look at the website you provided, and did note that they do talk about rewarding process, not outcomes. They also separate recreational sports from more competitive ones. Possibly your son's coaches are using this patch system inappropriately. Why not talk to the coach and mention how the patch system is affecting your son? Also, show your son that there's more to enjoying sports than participating on an organized team. Go out in the backyard after dinner and kick the ball around a bit with your son! Promote opportunities for your son to play casual games with neighborhood friends. Good luck.